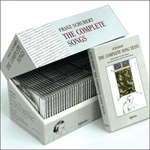 Like Der Tanz – the quartet which ended Volume 35 of the Hyperion Schubert edition – this pièce d’occasion with piano-duet accompaniment is linked with the slightly enigmatic figure of Irene Kiesewetter (1811-1872). She was the daughter of Raphael Georg Kiesewetter von Wiesenbrunn (1773-1850), the distinguished civil servant, musicologist and sometime singer (he had a bass voice). He had taken part in various performances of Schubert’s music including Geist der Liebe in 1823, and he was renowned for his collection of ancient choral music – sometimes taking it upon himself to organise entire concerts of music by such composers as Palestrina. The adolescent Irene, adored by her father, was a talented pianist. In a letter to Marie Pachler of 29 January 1828, Johann Baptist Jenger named Irene as ‘one of the foremost pianists in Vienna’ despite the fact that she was not yet seventeen years old. She was a piano-duettist partner with Jenger for Schubert’s Divertissement à la hongroise, and an accompanist for that fine tenorial baritone, Baron von Schönstein. She was thus obviously known to Schubert as a gifted young musician, and she seems to have admired him enormously too – her name is to be found on the subscribers’ list for Schwanengesang. It seems that Irene had been unwell and had made a recovery. (Jenger’s letter to Marie Pachler tells us as much.) Perhaps her father approached Schubert with the suggestion that he should write an occasional piece to celebrate her return to health. He had already written Der Tanz for her (although the date of that piece is uncertain) and now it seems he was persuaded to write this piece of music for very unusual forces – male quartet, mixed chorus and piano duet. The anonymous text is in Italian. Kiesewetter’s collection of choral music from the fifteenth to eighteenth centuries was chiefly in this language, and Italian singers (including the famous Luigi Lablache) were regular visitors to the Kiesewetter house (the virtuoso pianist Karl von Bocklet once improvised there on a theme given him by Lablache). The way the music is written gives us some clue as to how it was performed. It was clearly meant to be a surprise for the convalescent girl; thus she would have played no part in its performance, and it is almost certain that the piano-duettists would have been Schubert himself and Jenger who was clearly on close terms with the family. The modest vocal quartet which begins the piece (two tenors and two basses) might have included such artists as Titze, Barth, Josef Götz and Lablache himself. The water-imagery of the poem is nicely depicted by the flowing accompaniment which supports a mellifluous vocal cantilena for the four voices. With this Irene would have been delighted enough, and it is certain that she had no idea what Schubert (no doubt thanks to her father’s planning) had in store for her. The quartet section arrives at a pomposo cadence on the dominant. One would think that the piece would soon come to an end. But suddenly, with the words ‘Eviva dunque la bella Irene’, we hear the exciting sound of a four-part male chorus, no less. This must have been a real surprise for Irene, and the singers were no doubt initially hidden from her view, perhaps behind various pillars in the spacious Kiesewetter music room. And then, if this was not enough, these forces are suddenly joined after ten bars by a chorus of sopranos and altos, turning the music into a veritable blazing finale à la Rossini. This piece could not have been effectively performed without arranging for the whole of Domenico Barbaja’s Italian company (certainly the chorus) from the Kärntnertor Theatre to serenade Irene in this enchanting way. (This further explains the need for an Italian text, unlike the more modest Der Tanz.) 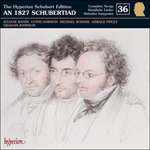 One can discern the extravagant hand of Lablache in this typically Italian celebratory plan, and also Schubert’s practical side in providing music which is not difficult to read – thus easily learned – and yet highly effective in performance. The way that this music grows from a small stream into a mighty river is a real coup de théâtre, something planned as a one-off event requiring not a little preparation and subterfuge to surprise ‘la bella Irene’. And thus we leave Schubert in 1827 – with a jolly piece of music as far away from the famous Winterreise as might be imagined – written for a frail young lady who would live until 1872. The composer who had so kindly agreed to mark the cure of Irene had no reason to rejoice in his own. No one could know, least of all the composer himself, that when this piece was performed on 26 December 1827, Franz Schubert had already celebrated his last Christmas. Al par del ruscelletto chiaro la tua vita scorra Irene. e l’amistà, virtù e fè. più amaro ond’ esser prodigo con te. per lunga età, risplenda ancor. la delizia del nostro amor. Irene, may your life flow like a clear little stream. so that it may be more bountiful with you. for a long time, and still longer. the delight of our love.